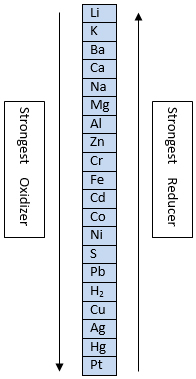 The activity series lists elements in their order of strength as oxidizers or reducers. This is what determines if a reaction will or will not occur. Q: Does this reaction make sense according to the activity series? A: Yes; Since Mg is listed above H in the activity series, it makes a stronger reducer. Therefore, it makes sense that Mg would be the reducing agent. A: Copper because its charge increased from 0 to +2. A: H was reduced, making it an oxidizing agent (it oxidized Cu). A: Cu was oxidized, making it a reducing agent (it reduced H). A: No; Since Cu is listed below H in the activity series, it means that hydrogen is actually the stronger reducer. Therefore, Cu could not possibly reduce H and this reaction would not take place.